And here we go again. Over the Memorial Day weekend, I was catching up on some reading, which sometimes leads me to reading pseudoscience claims of some random vaccine denier. In this case, it was an article that claimed that it had “irrefutable evidence” that diseases were eliminated by better sanitation rather than vaccination. Well, I am always one to read up on “irrefutable evidence”, but it’s possible that my standard for “irrefutable evidence” is different than most others. And in fact, real science assumes that most evidence can be scientifically refuted, so it never speaks in such absolutes. So that’s hint #1 that I’m going to be disappointed. The author of this article, Dave Mihalovic, is a naturopathic doctor (typically someone who eschews science-based medicine in favor of pseudoscience like homeopathy and acupuncture), who claims to be a “vaccine researcher.” If he’s a vaccine researcher, he has published exactly zero indexed articles about vaccines, or any other field of real medicine–not exactly prolific. I think we can probably assume that his standard of research meant he spent a few hours on Google and thinks he’s now as smart as anyone who actually has a bachelor’s and doctoral degree in immunology, virology, biochemistry or some other biomedical science along with a decade or two research in a world class laboratory. A summary review of data on neurological adverse events and the historical role of vaccination in the natural course of infectious disease in Switzerland and Germany, supports data from other regions with evidence that vaccines had no impact on disease prevention efforts from the early-mid to late 20th century. 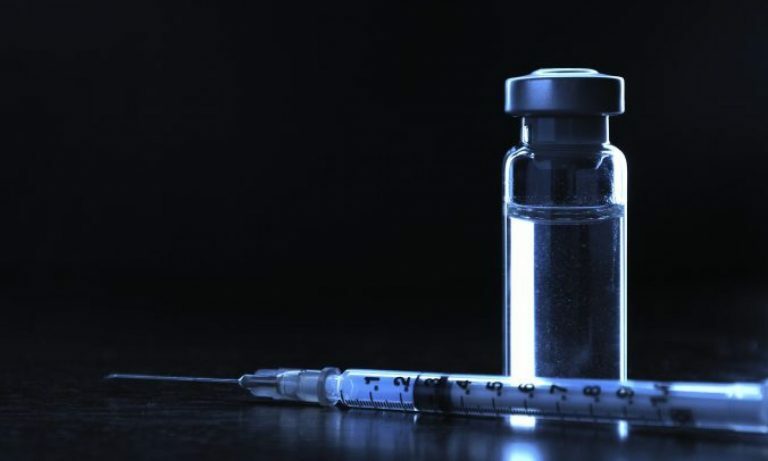 The data contradicts widespread misinformation campaigns by mainstream medicine which claim that vaccination led to immunization and a subsequent decline in infectious disease. The review supports other data around the world and mounting evidence that vaccine effectiveness is unproven, unjustified and lacking evidence-based medicine. So Mihalovic thinks that vaccination had no historical role in infectious diseases, disease were eliminated by anything but vaccines? Where does he get this belief? He found it in an article in Progress in Health Science (pdf), a self-published journal from the University of Bialystok in Poland. This journal is not indexed in PubMed, it has 0 impact factor (meaning that few or no other published articles cite these articles in this journal), and it’s impossible to determine if there’s a real peer review process for the articles. Thus, before we can critique the quality of Mihalovic’s information, we can’t even get past the low quality of sources he uses to support his claim that vaccines had “no impact on disease prevention.” Mihalovic makes claims using pretty graphs about various vaccines, but most of them use data from the late 1800’s and very early 1900’s. The problem with the older data is two-fold: the quality of medical science at that time was vastly different than it is today, and secondly, it is cherry-picking data from the broad history of vaccinations. However, let’s focus on whooping cough(Bordetella pertussis) which is easily prevented with the DTaP vaccine along with the earlier versions of it, the DPT vaccine (introduced in the 1950’s) and the original pertussis vaccine introduced in the early 1940’s. 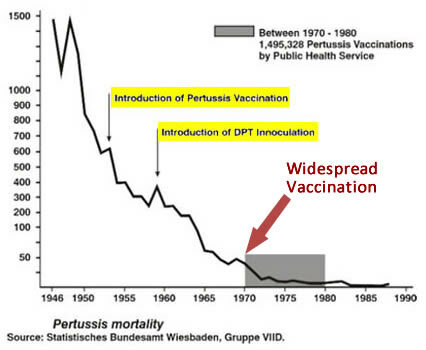 Figure 1 illustrates the change in pertussis mortality in Germany from 1946 (immediately after WWII) through the early 1990’s. The most important aspect of this graphic is that it only includes mortality (that is, death) from pertussis, which we can presume has decreased because of better medical care. We know how to treat pertussis better which lead to a reduction the mortality rate. They’re trying to claim that the mortality numbers from pertussis was dropping prior to the beginning of pertussis vaccinations. Which leads us to the morbidity rate, that is, the number of individuals who catch the disease. It shows a different story. 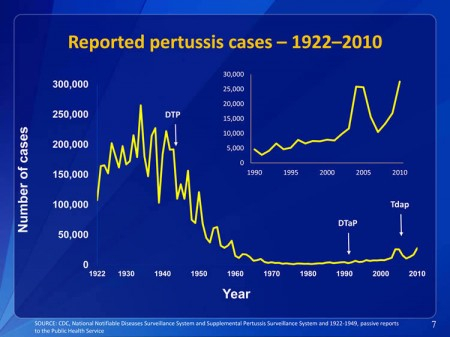 Figure 2, from CDC data, shows how the number of pertussis cases in the USA dropped from 200-250 thousand per year in the 1940’s, just prior to the advent of the DTP vaccine, to around 5,000 in the mid 1990’s, though it has up ticked to around 25,000 because of issues of effectiveness of the acellular version of the pertussis vaccine. By the way, the population of the USA is about 2.5X larger than it was in 1930, which means the morbidity rate of whooping cough has dropped more dramatically if it is adjusted to a rate of disease per 1000 children. In the 1930’s the rate of infection by pertussis was around 13 per 1,000 children, compared to approximately 0.5 per 1,000 today. Further refutation comes from a study of data in Germany from 1946 to the 2000’s, actually published in a peer-reviewed, high impact factor journal, which shows that the rate of pertussis morbidity was constant until 1965, when mandatory pertussis vaccinations for children in Germany was started. The incidence of infection per 100,000 individuals (adults and children) fell from over 100 to less than 1 from 1965 to 1992. That’s a +99% decrease in the rate during nearly 30 years of vaccination. Take a look at the graphic below. It’s shows what happened to both pertussis morbidity AND mortality over the years when Japan stopped vaccinating with the pertussis vaccine in 1974. The vaccination rate fell to around 10% which is correlated with the increase in mortality from 0 to 41 between 1974 and 1979. And the morbidity from whooping cough skyrocketed from 373 cases in 1974 to over 13,000 cases in 1979. Then after noticing this number, Japan reintroduced the vaccine in 1981, and by 1983, there were no deaths and just 130 cases of whooping cough. This is dramatic. It is controlled within one country. And it is clear that Japan did not suddenly have poor sanitation in the 1970’s and fixed it in the 1980’s. That’s just ridiculous. As I write this, I couldn’t actually find any actual evidence, other than these type of false correlations, that whooping cough morbidity is impacted by proper sanitation. Once again, the vaccine deniers try to invent information where there is none. They cherry pick mortality over the more broad morbidity. They ignore data in peer-reviewed journals that don’t support their belief that vaccines had nothing to do with ending disease. The whooping cough vaccine dropped the level of the disease to nearly nothing. All of us realize that the acellular version of the vaccine has some vulnerability to it, but science will fix that over time. Vaccines do save lives. And we proved it again. Hellenbrand W, Beier D, Jensen E, Littmann M, Meyer C, Oppermann H, Wirsing von König CH, Reiter S. The epidemiology of pertussis in Germany: past and present. BMC Infect Dis. 2009 Feb 25;9:22. doi: 10.1186/1471-2334-9-22. PubMed PMID: 19243604; PubMed Central PMCID: PMC2653494.